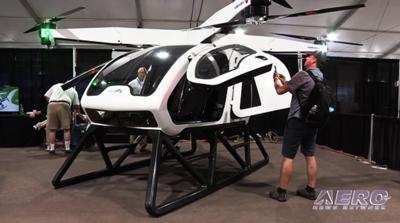 The FAA has granted approval for test flights of the SureFly electric hybrid helicopter developed by Workhorse Groups. The agency has granted an Experimental Airworthiness Certificate that will allow the company to conduct the test flights. The first test flight is scheduled for 12:00 p.m. local time in Las Vegas on January 8, 2018, prior to the start of the 2018 Consumer Electronic Show (CES). On December 27, 2017, Workhorse announced that it intends to spin off its SureFly business into a separate publicly traded company called SureFly, Inc.
SureFly's hybrid design leverages Workhorse's battery pack, management systems and controls utilized in its currently commercialized range-extended battery electric trucks. SureFly's gasoline combustion engine generates electricity and a parallel battery pack offers a backup power source, eliminating the need for larger batteries or long battery charging periods between flights. Pilots who have inspected SureFly are attracted to its easy-to-pilot design -- the aircraft is piloted by joystick in a similar fashion to flying a drone. The SureFly is expected to be capable of carrying a pilot and passenger or cargo up to 70 miles. After a quick refueling, SureFly will be ready for the next hop. Early models will be pilot-operated. Future models are intended to be capable of autonomous flight. Anticipated markets for the SureFly are precision agriculture, surveillance, aerial inspection, emergency response tasks, urban commuting and various military applications. The company is working toward full FAA certification of the helicopter in late 2019. The expected price of the SureFly is approximately $200,000. SureFly, the world's first electric hybrid helicopter, features a drone-like octocopter design, a two-person, 400-pound payload capacity and a range of approximately 70 miles. SureFly was first unveiled at the Paris Air Show in June 2017, and will be on display at the Workhorse CES exhibit. The company is currently accepting preorders for the aircraft.